A new Board of Directors has now been appointed at Coleman & Company, consisting of yours truly as Chairman, Mark Coleman as Managing Director, Lesley Morris as Finance Director and Company Secretary, Mark Carless as Contracts Director and Malcolm Garner as Non Executive Director. This is the first time that persons other than Coleman family members have been instrumental in the management of the company in the form of Mark Carless. The fact that Mark Carless is a lifelong Aston Villa supporter makes this decision even more remarkable! The board comprises of people whom have been known to me, as individuals in association with the company, for periods in excess of twenty years each. The company now, nationally, employing more than 150 people, with many more sub contractors or in the contract support sectors, is no longer “a one man band” but a leading contractor offering a broad range of demolition and associated services such as complex demolition, industrial demolition, explosive demolition, specialist deconstruction and dismantling, high reach demolition, tower block demolition in addition to specialist cutting, materials recovery, asbestos removal and most recently contaminated land remediation. The diversified and professional nature of our business makes me very proud. In putting these words together, in recalling the trials, the tribulations, the effects on my life, both happy and sad, good and bad, of developing and running a successful company over a period of Fifty Years, the enjoyment and pleasure of being privileged to work my Father and then my Son it has been tremendously helpful in assisting my powers of recollection to recover from the “loss of memory” that I had suffered as part of the near fatal Sepsis illness of a little over two years ago. There are many more recollections that I have not wished to record here, but one thing is for sure that there can be no deviation from the fact, that is “success does not just happen it has to be made to happen, it has to be worked for, to be earned, it is not a thing that comes easy, nor does it just occur.” People envy what Coleman & Company have and are, but little do most realise what has gone into creating the business, the sacrifices that have been made in achieving and maintaining standards, that many would not even consider, but that is what sets us apart as a demolition contractor of not only national but global repute. We are rightly proud in having a record that is to be envied, as a stable multi award winning contractor or as a caring, responsible employer, with a duty to its employees, as the employees have a duty to their employer proven by the fact that we have presented Gold Watches for long service of 25 years to John Burns (R.I.P. ), Jim Williams, Roger Ratcliffe, Keith Burnham, David Nestor and John O Grady, the latter two having completed 30 years service, with the ever youthful and energetic John O Grady still in harness having completed 35years (can you hear him grinding his teeth?)! 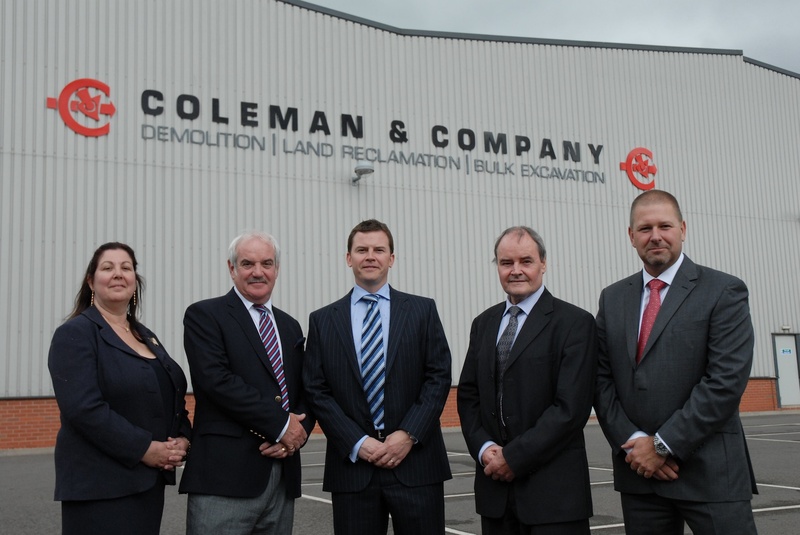 Why not learn more about the Coleman team who lie at the heart of Coleman story. This entry was posted in Aggregate production and supply, Commercial Demolition, Complex Demolition, Corporate Social Responsibility, Demolition, Explosive Demolition, Facade Retention, Family Business, Friendships, High Rise Demolition, Hospital Demolition, Industrial Demolition, Land Reclamation, Land Remediation, Recycling, Specialist Cutting, Temporary Works. Bookmark the permalink.